If you are in charge of your institution’s Facebook Page, get ready. Facebook will automatically push Timeline to all pages on March 30. Your institution has a wonderful opportunity to tell its story in a more visual and dynamic way. Change can be a good thing! Download the Facebook Timeline Cheat Sheet to take full advantage of the new features Timeline offers, see size measurements for various images, and learn tips and tricks. And when you “go live” with your updated Page, tell me! Leave a link in the comments and let me know your favorite new feature. I have thoroughly enjoyed writing this series of blog posts on Facebook tabs for mStoner’s blog. It has been fun to explore how other industries are engaging their customers, viewers, and supporters in social spaces. Sadly enough, all good things must come to an end. You probably know that Facebook users no longer need to “like” your Page before they interact with wall content. But, did you know that Facebook tabs have a nifty feature where you can limit tab content to those who have not “liked” your Page? Encourage the “like” by telling potential-fans the value that exists under the hood, the value they can only get by clicking the “like” button. 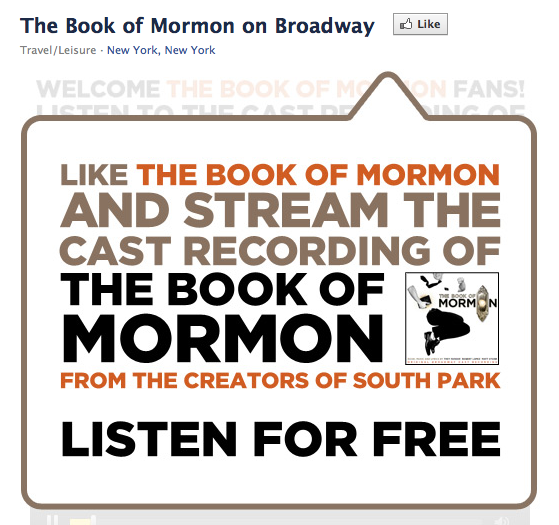 The Book of Mormon, NYC’s hottest show on Broadway, gets your “like” by allowing you to stream the cast recording for free. And there are few things better than free, especially when it comes to streaming music. See how the tab changed after I “liked” the Page? The ability to listen to the soundtrack for free is a great way to introduce the show to the un-initiated or give super fans a reason to keep coming back to the Page. 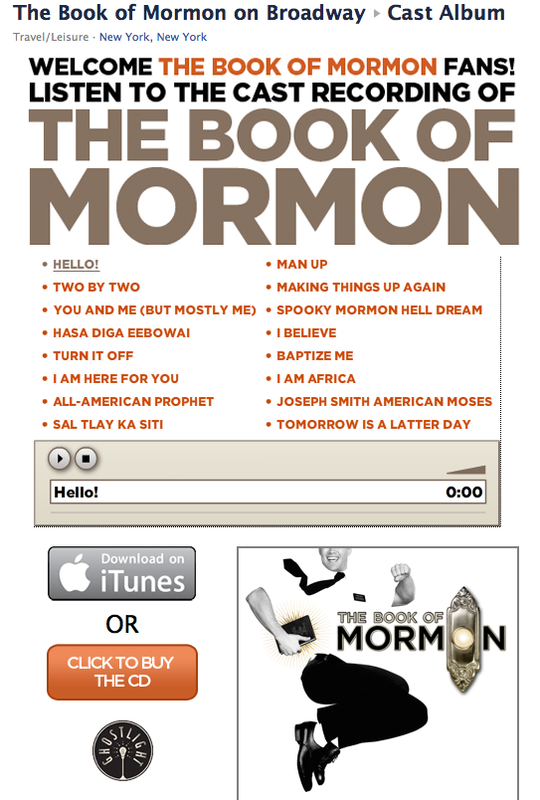 Book of Mormon identified the number one value-add they could provide their Facebook community and they were smart enough to require you to “like” their Page first. Kudos! How do we make this apply to .edu? I rarely see .edu Pages taking advantage of this feature. The tough part is figuring out what value you can offer to your audience. If you have a Page just for your institution’s alumni you could place videos from reunion or information about upcoming events under the hood. 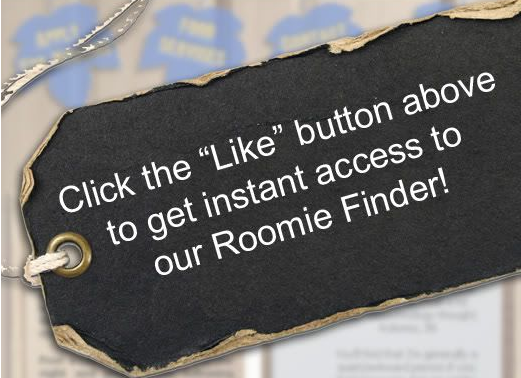 Or draw inspiration from Indiana State’s approach and offer a roommate finder to your incoming class. What are your favorite Facebook tabs from outside .edu? We’d love to hear your thoughts and see your examples. The third post is a series of blogs I wrote for mStoner’s blog. This one is my favorite! Discount shopping sites have revolutionized how American consumers are accessing designer brands. 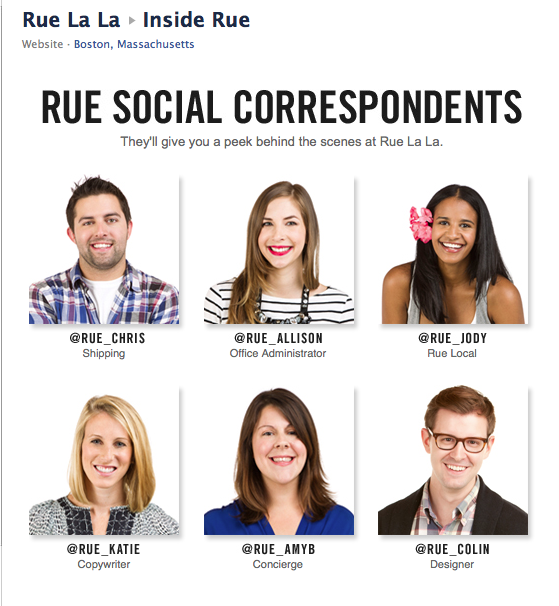 Rue La La isn’t the only one in the marketplace, but they are by far the most interesting when it comes to their social presence. I’m often tweeting about how innovative and engaging they are and recently I featured their blog in a guest lecture to a business class at a Vermont college. 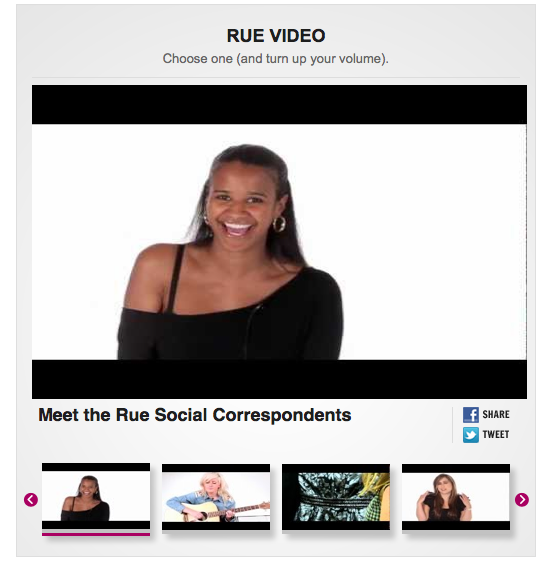 A month ago Rue La La did it again, showing their social media prowess with a brand new “Inside Rue” Facebook tab. The goal is clearly to introduce you to the fabulous team at Rue. I think they nailed it. The tab is clean and full of interactive and sharable content. It incorporates video, quizzes, and calls out to various twitter accounts. There are at least five ways within the tab where you can share content you find interesting with your Facebook friends and Twitter followers. I hope you can imagine the endless ways this example could be translated to .edu Pages! Feature admission counselors on twitter and their territories. Incorporate your institution’s branding and messaging into fun wall post sayings. Highlight the videos your marketing team spent long hours creating in an easy to view and easy to share format. My favorite idea to pull from Rue is the interactive quiz. How easy would it be to put together a five-question quiz for prospective students to take so they can figure out what “type of student” they would be? What ideas are you inspired to try after seeing Rue La La’s tab? Share your thoughts with us! Next up: Broadway, of course. Note: I will be a regular contributor to mStoner’s blog. This is a cross-post from my recent entry there. It is important to provide your audience with a cohesive web experience. Customized tabs on Facebook can help achieve that goal, but they can do so much more! In the coming weeks I will highlight examples of compelling Facebook tabs from outside .edu that encourage your audience to “like” your Page and will keep them coming back. Barack Obama – Are You In? 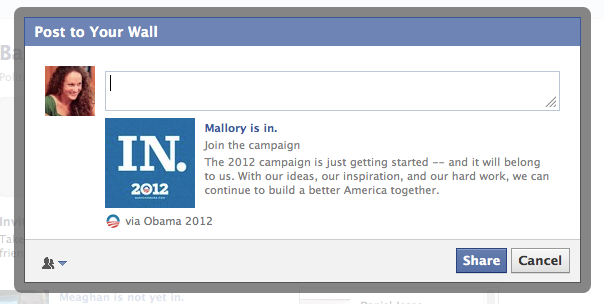 No surprise here, the Obama campaign is well-respected for using social media in new ways to inspire supporters. I love the idea behind the “Are You In?” tab. 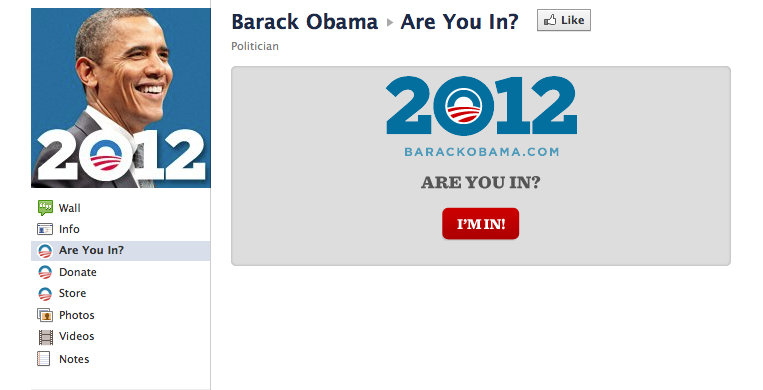 First, you show your support by clicking “I’m in!” (simple, quick, and really what could be easier?) and then you are given the option to connect your Facebook account to see if your friends are in too. You are prompted to share that you “are in” on your wall and encouraged to invite your friends to join. Obama wants his supporters to spread the word for him, clearly aware that Americans trust friends and online recommendations far more than advertising messages. Envision “Are You In” as “Are You Applying?” Once you click “I’m Applying” the tab allows you to connect your Facebook account so you can share the good news with your friends. The tab then morphs into a place where you can invite your friends to join and interact with others who are also applying. Keep it social by giving prospective students a place to offer each other essay writing tips or ask current students questions about campus life. Is your institution doing something new or different with Facebook tabs? We’d love to hear from you. Next up: A favorite cartoon. Ready or not, it’s time to upgrade! I am personally excited for the opportunity to upgrade old groups. Over a year ago I created the Class of 2015 group for Saint Michael’s College. When Facebook launched the new group, (which includes a more interactive wall, chat features, post notifications, the ability to add documents and more) I was green with envy and sad that I wouldn’t be able to try it out with the Class of 2015. Have you been using the new Facebook group for your incoming class? Do you seen more interaction among the students? What do you think about Facebook pushing old groups into the new group style? 1. You might already have claimed the original Place for your business, institution, or location. So this move by Facebook essentially is creating a second Place. 3. The option to merge claimed Places with Pages has not been active for some time. 2. Make sure that the address you are using for your business is accurate according to Bing. 3. Report the bug to Facebook. No guarantees anything will happen, but it’s worth a try! Any solutions to add? Comment below! Here’s hoping that Facebook sorts this out quickly. In “Edit Settings” you can hide the map by unchecking the box, shown below. Facebook says that if you modify your address the map will refresh, however I have done this a few times with zero results. 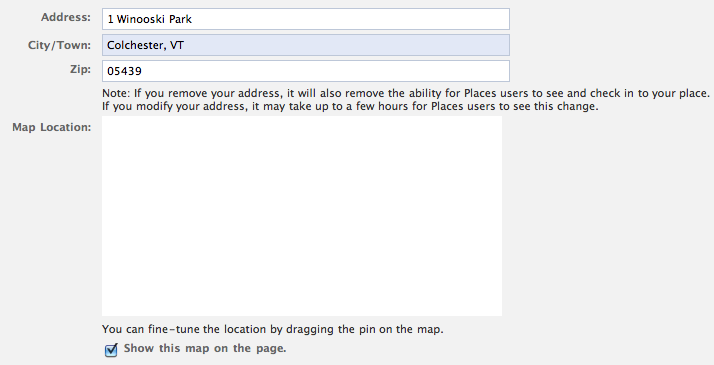 Facebook also says you can fine-tune the pin location, but as you can see the map does not even show up in Settings. Are other users experiencing the same difficulties? With the boom of Quora and Formspring, I think many marketing professionals figured that it was only a matter of time until Facebook revamped their Questions feature. It has been roughly one week since Questions relaunched and I have noticed more individuals asking questions than Pages. I oversee and/or directly manage a number of Facebook Pages for the institution I work at and thus have been fortunate to have the opportunity for a little trial and error. In as short of a time as one week I have learned 3 important lessons when it comes to using Facebook Questions as a business. 1. People are lazy, so give them options! In Example 1 the answers are clearly “yes” and “no,” just like in Example 2. So why didn’t anyone respond? 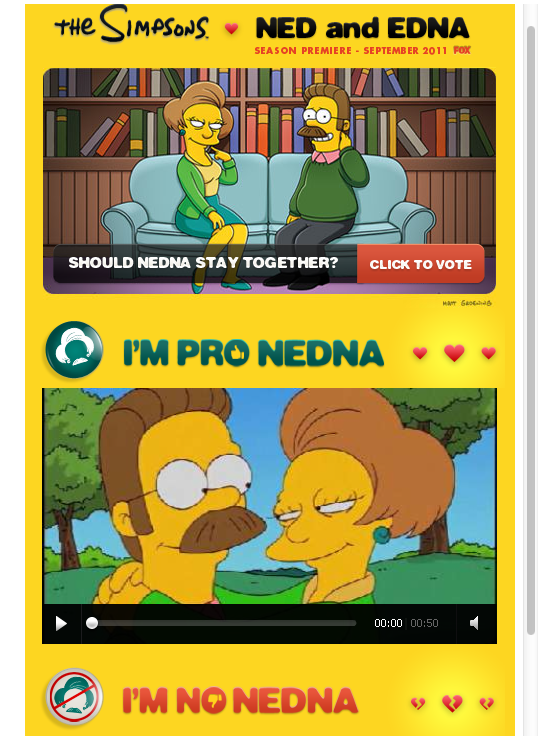 Because they were being asked to fill in the answers instead of just clicking on the radial button to vote. Make it easy for your audience to engage with you. Take the guesswork out of it. If the answers are clear, provide them. And don’t forget, unless you want people to add options uncheck the box! 2. Don’t forget the fold. Only 3 answer options will appear above the fold, but as you can see below there were more options given. In this example, no one has voted for “Not quite the finals.” Either SMC students have a lot of faith in the men’s lax team or they aren’t taking the time to see what that last option is. My recommendation is: try to boil down the answers to 3 and go with it. 3. The answers will move based on votes. When people vote the answers will rearrange and put their choice on top. The lesson here? Don’t letter your answers! 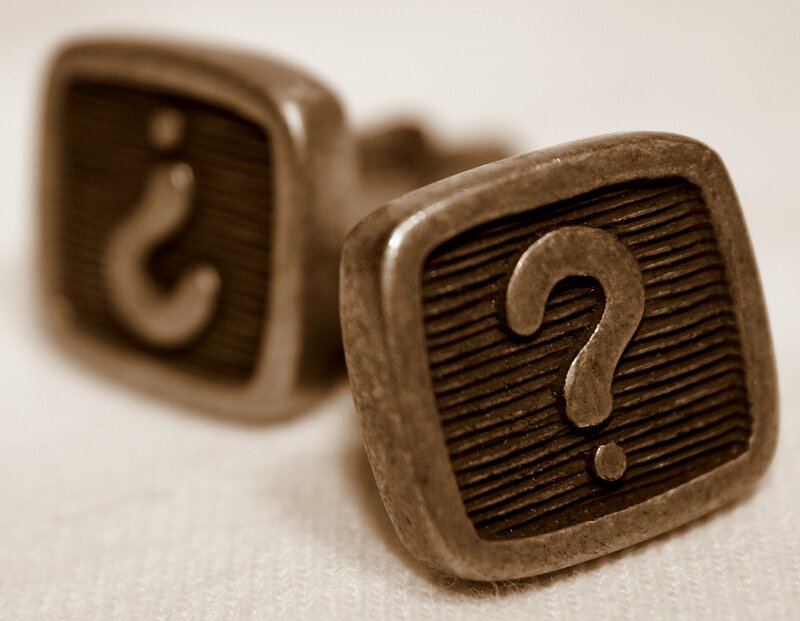 I think that Facebook Questions could be a valuable tool for your business. Whether you choose to use this tool in a funny or serious way, having the ability to ask your audience a question and get an immediate response is priceless. What other tricks have you discovered? Contribute to this discussion in the comments. Facebook and Enrollment – What do future students want? Recently All Facebook has been all about higher education. In my previous post “Admission Counselors on Facebook?” I attempted to clear up some miscontrued Kaplan survey results that All Facebook reported on. My first reaction = It’s cool… it’s really cool…but who will actually do it? When Suzie HighSchool gets home from softball practice she might log into Facebook. But, I’ll put $10 on the fact that she is not going there to conduct her college search. She is going to Facebook to connect with her peers and future classmates. Suzie hits up your website or sites like Zinch (which are geared towards the college search process) to start her college search. I believe that future students search for your institution on Facebook typically after they have applied to your school or have been admitted. They want to join groups related to the college, their class year, and/or clubs and programs your institution offers that are of interest to them. In short, they go to Facebook to connect and engage with other humans. Nothin’ like twisting around some statistics to start off your Monday. Higher ed and Admission folks may have missed this article over the weekend from All Facebook but twitter was well… a-twitter with this Huffington Post story this morning that ominously warns prospective students to clean up their Facebook profile or else be rejected from every school you have applied to. To state (in the original article) that “Four out of every five college admissions offices use Facebook to recruit students” is not equivalent to “Four out of five college admission offices use Facebook in the application decision making process” which is the conclusion that the Huffington Post jumps to. This blatant misrepresentation of Kaplan’s statistics (which I can’t seem to find) is frustrating. I spent two years in Admissions and during reading season you are… big surprise… READING! God help me if I had time to do anything else. I google’d an applicant once because the essay seemed too good to be true given the student’s test scores and transcript, but even in that case I was googling the essay and not the student herself. St. Mike’s is considered one of the 80% of schools that use Facebook to connect with students, but that’s all we do, we connect with them and we do it appropriately – through Pages and Groups. Admission counselors aren’t friending students or witch hunting them. I continue to connect with hundreds of prospective students via the Class of 2015 Group, but I will never click on a student’s name to see their profile. I don’t have the time and frankly, I don’t care. Are you John Smith? Or John Smith? Have you ever accidentally friended the wrong person? Maybe not, because there is a good chance you can recognize them from their photo. I just did a search for John Smith of Boston, MA. Do you want to guess how many results were returned? 8 bagillion. In my conversation with Mark, he raised the question of the legality of all of this. That’s an answer neither of us had and one I doubt a school wants to be put in a position to find out. What’s your take on these articles? Are you an admission counselor that consider the Facebook profile of their applicants? UPDATE 1: Here is the Kaplan Survey that both articles referenced. Big thanks to Katye Robare Munger for locating it. UPDATE 2: What does an Admission Counselor actually look for in an applicant? Carrie Pratt, Admission Counselor at Saint Michael’s, writes this blog post.